If not … don’t worry. To most people, it won’t look like anything … a series of letters and numbers strung together in random order. And it won’t just affect the economy. This code will pave the way for exciting new innovations that will change the way we live … forever. To shocking medical advancements that could extend human lifespans by as much as 40 years. This code is arriving at such a breakneck pace that right now the world’s top businesses and investors are rushing to get in … and government officials and corporate executives are pounding for a seat at the table. Insiders show Amazon is investing $19 million. Google has dedicated over $100 million. And that’s just a drop in the bucket compared to these next two: IBM and Microsoft have invested $2 billion … each. But it’s not just big technology conglomerates who are getting on board. Australia’s Parliament has already set aside $230 million. The British government is spending 10 times that — a staggering $2.3 billion. The White House has set aside even more. They’ve budgeted $19 billion just for this year … with plans to spend more in the next. And recently, senators from five different states have sponsored a bill called “MAIN STREET” that will use this code to more than double the number of small businesses in the U.S., putting millions of Americans back to work and cutting America’s unemployment rate nearly to zero. Jeff Immelt, the CEO of General Electric, calls it “mammothly important” to future technology. Today, the market for this code is $80 billion. But as demand rises, experts predict this $80 billion market will transform into a $1 trillion powerhouse by 2021 … a massive 1,200% increase in the next four years…. And 10 times as large as the global market for televisions. While this code will transform this $80 billion market into a $1 trillion powerhouse, those who invest in the right company today could earn an absolute fortune. 1,200% is just the start. Enough to turn every $500 into roughly $24,000 … $35,000 … and $98,000. I believe this opportunity could do similar for you. In fact, I think it could do far greater. At the heart of this code is a remarkably innovative company that has seen its earnings quadruple over the last three years as companies like Pfizer, Time Magazine, Rockwell Automation, Barclays, Regal Cinemas, Duracell and many others have signed on … and many, including myself, believe this is just the beginning. The opportunity inside this code is so great that this one company could go on to become one of the greatest investment stories of all time … greater than Amazon, Microsoft or Google … giving those who invest now the opportunity to amass an enormous amount of wealth, providing you and your family a legacy that lasts for generations. The best part is that anyone can take advantage of this opportunity. It doesn’t matter your age, income or investment background. An investment of just $100 would still be enough to remodel your home … buy a new car … or afford a lavish European vacation for you and your family. This opportunity is so large — and so potentially lucrative — that it could pass you by in a matter of days, so you must get started now. In a moment, I’ll show you why this one investment could set you and your family up for decades to come and transform your financial destiny. But before I get into the exact details … it’s important for you to understand who I am and why I dropped everything I was doing to record this presentation the moment I learned about this code. My name is Jeff Yastine. I have built my entire career around speaking with the powerful, the influential and the informed to get to the bottom of things. And political heavyweights such as Donald Trump, Mitt Romney, Bill Clinton, and Sarah Palin — to name a few — frequently visited my company’s office to discuss critical matters with myself and our corporate executives. 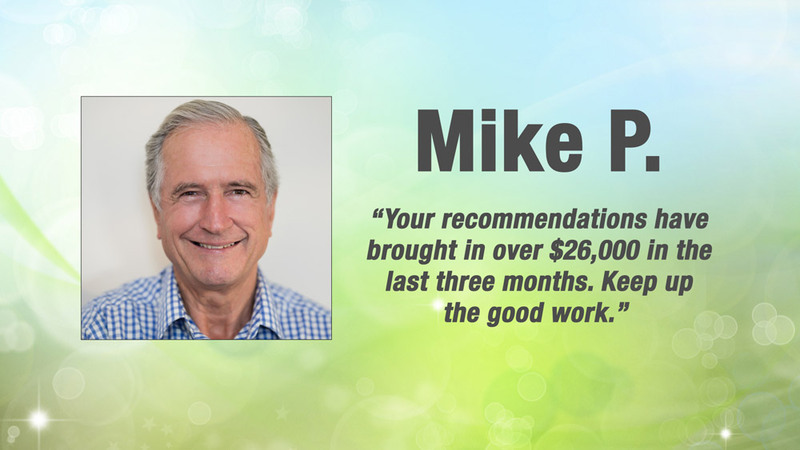 If my name sounds familiar, you may recognize me from my time at the Nightly Business Report, where I earned an Emmy nomination broadcasting to millions of Americans who, every night, tuned in to hear my financial guidance on the most important trends in the market. Not only have I had a successful career, I’m happy to say that my research and industry contacts have provided me with the financial wisdom I needed to not only survive, but prosper through decades of stock market turmoil … and has provided my family and I with the life we always dreamed of, living just steps from the beach in one of the most exotic zip codes in America. 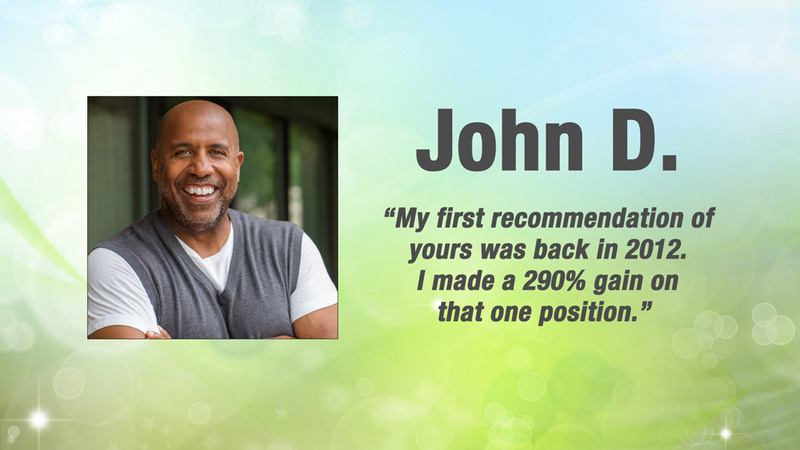 For example, on just one of my big wins, I turned an investment of just $180,000 into a $1.5 million windfall … an 833% gain on my money in just a few years. But I recognize most Americans haven’t had the same experience. I remember all too well what it was like in 2000 and 2008 when the market crashed. Millions saw their retirements devastated as stocks fell 50%. Some never recovered. That’s why, a few years ago, I decided to take all the knowledge and insights I’ve gained over the years and pay it forward. I left my job at one of America’s biggest media conglomerates to become the executive director at a revolutionary investment research firm … forming a team with some of the most brilliant minds in finance to bring our insights straight to Main Street Americans. You see, typically the average investor has only had two options when it comes to investing. You can invest with a professional adviser who is paid to push his company’s plain-vanilla advice, or invest on your own without any help at all. We decided to create a third option. A remarkably innovative solution that puts our investment analysis directly in the hands of Main Street investors, including a model portfolio of stocks that lets you know what to buy, when to buy it and when to sell. And we do this by connecting you with some of the most successful investors in the world, offering you world-class investment research at a fraction of the cost. Our team includes a former U.S. congressman and bestselling author … a famed economist and adviser of presidents and world leaders … a Wall Street legend and multibillion-dollar hedge fund manager … a former nuclear missile architect who is revered by many as one of the top traders in the world … and many other world-class financiers who are top experts in their fields. And many other big wins … each within a few years … some of them in just months. Using our research, paired with our expert analysis, I’m confident we can help you turn even a modest net worth into millions. 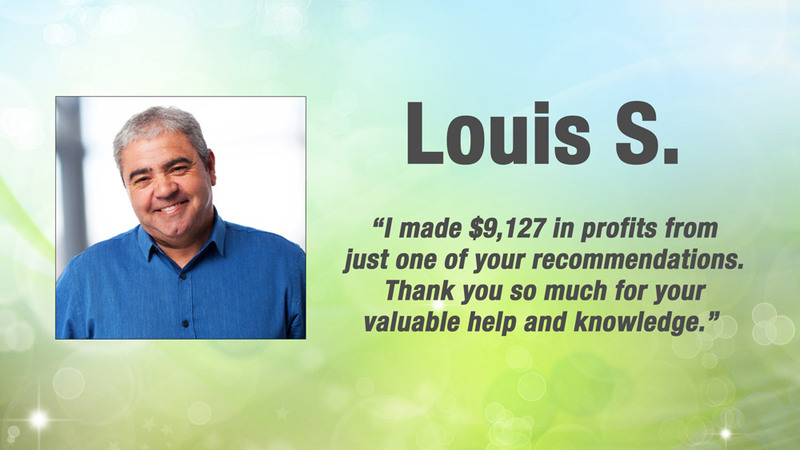 I get no greater joy than to hear from people like John, Louis, Mike, Fred and so many others who have been able to transform their financial lives thanks to our research. I have never been so excited about an investment opportunity than I am, right now, about this revolutionary computer code you see on your screen. Over the last few months, my team and I have poured through endless stacks of financial documents, consulted with legions of industry contacts, and spent countless 16-hour days researching the latest trends in technology. This simple line of code will soon pave the way for exciting new innovations that propel America into a new golden age of technology. Not only that, it will transform industry, offering companies the chance to save as much as $400 billion each year . Today, the market for this code is just $80 billion. But as demand rises … experts predict it will grow 1,200% over the next four years … blossoming into a massive, $1 trillion industry by 2021. The potential gains to be made are enormous. Yet the company behind this code is about to unleash such a remarkable and critical new breakthrough that those who invest right now could see gains greater than all of these COMBINED. It’s a technology that has revolutionized the way we do business, connecting billions of people from all over the earth and placing the world’s information at our fingertips. I’m talking about the Internet. From the turn of the century, the number of Internet users has increased from roughly 360 million in the year 2000 … to more than 2 billion today. The way we live is completely different. Today we can open a Web page and get information we once could only get from an encyclopedia, newspaper or library. We open our email to send a “letter” that once took days … even weeks. And we can go on websites like Amazon or eBay to buy any number of consumer goods that once required a trip to Sears, Wal-Mart or Barnes & Noble … and have those goods sent straight to our door. The Internet has become so critical to our way of life, that if it went down for even a day, 200 billion emails wouldn’t be sent, more than $10 trillion in business would be interrupted and the world would become almost completely disconnected. But this code is about to change everything. From the way you send emails … visit websites and shop online … or connect with friends and family on social media. But this code won’t just affect the Internet’s many conveniences. Because without this code … the entire Internet could shut down. Not just for a day. Imagine losing all of your data … all your banking information and retirement accounts … even websites such as Google, Facebook and Amazon … forever. Not only that, but imagine being unable to buy goods with your credit card or get money out of an ATM. Without any way to accept money, businesses would be forced to close their doors and many would shut down. No food. No water. No medicine. I know that may sound extreme. But this is the exact scenario that our nation’s top security officials, corporate leaders and technological experts are preparing for at this very moment … because right now, an imminent threat is plotting to do just that. James Clapper, the recent U.S. director of national intelligence, says it’s the No. 1 threat facing our nation today, and legendary investor Warren Buffett calls it more hazardous than nuclear weapons. The White House even calls this threat a greater risk to the U.S. than terrorism. Already, businesses lose as much as $400 billion to this threat annually. And it’s growing so fast that by 2021, experts warn it could cost upward of $6 trillion each year — 14 times worse than it is today. Some experts predict that if left unchecked, it could gut America’s economy, make unemployment spike to 30% or higher, and cast a ripple effect across the world that topples governments, economies and businesses. Bottom line, if nothing is done to stop this threat, it will trigger an economic calamity of such immense proportion, it will ignite the next Great Depression. That’s why governments such as the U.S., Great Britain and Australia are all rushing to find a solution that will prevent this cataclysmic event from taking place … so are companies like Amazon, Microsoft and Google. But this need goes beyond governments and technology firms. Financial services firms are spending $1.5 billion to get access. JPMorgan Chase & Co. alone recently doubled its investment, topping $500 million. And Bank of America has gone on record to say it has no limit for how much it is willing to spend. And it’s not just them. Large retailers such as Wal-Mart, Target, Home Depot and Lowe’s … credit card companies like Visa, MasterCard and Discover … the list goes on and on … are ALL spending hundreds of millions, if not billions of dollars to find a solution. Is right here … inside this code. In the next few months, this code could single-handedly ensure a climactic scenario like the one I just mentioned never takes place. It will eliminate the single greatest threat facing the world today, and in so doing give investors the opportunity to become fantastically rich. And just what is this threat? Over the past few years, cybercrime has rapidly grown into the No. 1 threat facing the world today, costing businesses more than $400 billion in damages each year, unleashing 67,000 new Internet viruses each day and launching 170 new cyberattacks each hour. Cybercrime has grown so devastating, a single computer virus can cause damages worth as much as $38.5 billion. That’s why Ginni Rometty calls cybercrime the greatest threat to every profession, industry and business, why Warren Buffett calls it worse than nuclear weapons, and why the White House considers it a greater threat than terrorism. The fact is, cybercriminals are everywhere. And they can hack you through just about any website you visit … any email you open … or any text message you send. And once they get ahold of you … that’s it. They can even disable the alarm in your car or your home security system. To this day … hundreds of millions of Americans have been hacked by these dangerous criminals and more than 12 new people are hacked each second. They’re the most dangerous and tech-savvy people on the planet. Rather than target individuals directly, these “cybercrooks” are able to hack millions of people at once simply by hacking into large, centralized databases that store our personal information. Take for example a recent hack of our nation’s government. A colossal breach at the U.S. Office of Personnel Management exposed the records of almost every employee in federal, state and local government. Twenty-two million Americans in total, all HACKED. Hundreds, even thousands of our nation’s largest businesses have been hacked in a series of devastating attacks. 145 million eBay accounts … HACKED. 83 million clients at JPMorgan … HACKED. 56 million Home Depot cardholders … HACKED. 37 million users on Ashley Madison … HACKED. 110 million Target customers … HACKED. Every single one of them, HACKED, with more and more that are hacked each day. This is not just a serious problem. Our research concludes that more than HALF of small- to midsized businesses are hacked by cybercriminals each year … same for more than 75% of large, Fortune 500 companies. Once they’re hacked, it can cost anywhere from $200,000 … to $100 million to recover depending on the damage. $100 million … not a chance. Even the average cost of $15 million is enough to shut most businesses down for good. In fact, a National Cyber Security Alliance study found that 60% of small businesses that are hacked close their doors within just six months. All told, cybercrime costs businesses more than $400 billion in damages each year. But according to cybersecurity researchers, by 2021, cybercrime could grow to become 14 times worse than it is today … raising the costs to more than $6 trillion each year. And considering that as much as 80% of all cybercrime goes unreported … the costs could be five times that much. The Atlantic Council, a prestigious think tank in Washington, D.C., and many other top intelligence firms even fear this threat could bring economic growth to a standstill … disrupting more than $120 trillion in global business over the next decade. Which is why everyone from heads of state, corporate executives, industry think tanks, to Internet Webmasters and more are all rushing to find a solution before this threat grows any worse. This one you see on your screen … is the answer they’ve been looking for. 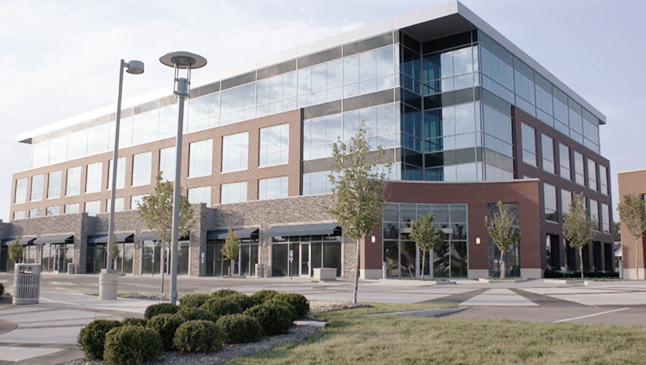 You see, a team of researchers at this small company … the one in this building right here … has been hard at work to develop an innovative solution that could put an END to cybercrime for good. With this single code, they’ve developed a solution that could bring an end to cybercrime forever … before a cataclysmic scenario like the one I described just moments ago takes place. You see, right now, the Internet is a little like this safe. All of your information is stored inside it. Your Social Security number … your credit card info … even your home address. Once a hacker breaks in, that’s it. There’s nothing you can do to stop them. What this code does … is it stops cybercriminals BEFORE they strike. This code adds one layer of defense after another so cybercriminals can never break in. Break through one layer, and there’s another waiting for him. Break through that, and another still. That’s why this code is such a game changer. It can stop cybercriminals dead in their tracks. Right now, the technology necessary to implement this code is heading to market while this small, innovative firm continues to fly beneath Wall Street’s radar. This affords you the opportunity to get in at the lowest possible price today and become part of one of the greatest investment stories of all time. Take a look at how far the cybersecurity industry has come in its short history and how much investors have been able to profit. In the late ‘80s, as the Internet was just taking off, hackers discovered they could install a “worm” or “virus” in local networks and use it to break into people’s computers. Like a drug in the human body, this anti-virus could find the virus and destroy it. And since this was during the tech boom, when personal computers went mainstream, the cybersecurity industry exploded higher … as suddenly, millions of computers needed anti-virus software like the one McAfee created. Perhaps the most well-known provider was Symantec. Symantec arrived on the scene with the Norton AntiVirus in the early ‘90s … selling millions of copies to combat the emerging cybercrime threat. As a result, its stock took off like a rocket, as you can see here… climbing 19,594% over the next decade. A mere $500 investment would have netted you $98,470 from this one trade alone. Vasco Data is another example. It shot up 6,962% in just four years. Enough to turn every $500 into $34,810. Check Point Software Technologies was another big player. This provider of IT security products launched a historic run of 4,851% in just two years. Enough to turn $500 into $24,255. Then there’s Gigamon. Its stock shot up 494%. Proofpoint, an emerging player in the industry, shot up a staggering 775%. In 2004, cybersecurity was a small, $3.5 billion industry. Today, it’s much higher … a mature $80 billion market. But thanks to this code … it is set to go parabolic. And 10 times bigger than the global television market. Fact is, cybersecurity is still in its infancy. Today, only half of all organizations use some form of data protection. Other reports show that figure as low as 20%. The market is nowhere close to being fully saturated. Companies simply aren’t protecting themselves. But as cybercrime is expected to grow much worse in the years to come, experts believe 90% of all organizations will adopt various layers of data protection. In fact, people will demand it. Very soon, customers will REFUSE to do business with any company that does not have proper security systems in place. That’s because cybercriminals can exploit any weakness they find. And in this age of digital technology, their job is only getting easier. By 2020, 4 billion people will be online … more than twice as many as today. And 200 BILLION devices will be connected to the Internet by then … from just a few billion right now. So, with more people … and more devices … experts estimate cybercriminals will have 50 times as much data to hack than there is right now. Meaning in the next four years … cybercrime could grow to be 50 times worse than it is today. Hence why cybersecurity stocks are destined to skyrocket. In the coming weeks and months, many of these companies will beat earnings estimates quarter after quarter … dwarfing every other sector of the market as much as tenfold. This is why investing in cybersecurity is as close to a sure thing as anything I’ve ever seen in my 30-year career as an investor. Governments and businesses both are pouring in billions upon billions of dollars. And while you could probably throw a dart at any one of the companies I mentioned before and ride the trend higher … it won’t compare to the amount you could make from the ONE COMPANY behind this remarkable new code that will take cybersecurity to a whole new level. You see, while most cybersecurity companies can help a business detect a virus or data breach after it’s occurred, they haven’t figured out how to stop them before the attack. So, up until now, cybercriminals have always made quick and dirty work of any firewall, anti-virus or malware protection they’ve come up against. This code cannot be hacked. Amazingly, it was designed to be able to detect the precise moment an unauthorized user is about to break in … and not only slams the door shut … but sends every bit of data the organization has to a secure digital “vault” until the threat is destroyed … usually within minutes. It could ensure YOUR personal information never gets stolen again. This code will do for cybersecurity what Google did for search … what Amazon did for shopping … what Netflix did for video streaming … and what Facebook did for social media. But it doesn’t just affect cybersecurity. The Internet, the economy, governments and businesses of all kinds. The stakes are simply too high for this one company to go ignored any longer. Once this code hits the market … its stock will soar higher. Time is of the essence. That’s why you must get in today. I cannot overstate just how big of an opportunity this is. This is the kind of investment people wait their entire lives to make. Wall Street is beginning to see the massive scale of it all, with several cybersecurity stocks such as Fortinet, Splunk and Mimecast already up 63% … 112% … and 248% just in the past year. And over the next few years … as 90% of organizations implement some form of data loss prevention ... from as little as just 20% today … these stocks will only soar higher. But none of them will march as high as the company behind this code … because this code makes all other cybersecurity firms virtually dispensable. By any stretch of the imagination, this company could quite possibly become one of, if not THE most valuable companies in the world … bigger than Amazon, Microsoft or Google … as it stops cybercrime in its tracks and provides the economy the security it needs to propel our nation forward. If you were going to make one investment in the next decade — this company is it. Remember … early cybersecurity investors have seen monumental gains of 4,000%, 7,000% and even 19,000%. Now that the industry is about to enter its greatest growth period … just as this company releases this unstoppable code that will stop cybercriminals in their tracks … I am confident that investors with the foresight to get in will be rewarded with massive gains … enough to change your and your family’s life for generations. But you have to get in RIGHT NOW. This story is so big and so explosive that this stock is destined to soar sky-high any day now. Fortune 100 companies … the 100 largest companies in the United States … already trust this company with their data. It’s responsible for protecting trillions upon trillions of dollars’ worth of critical data. And its customer base is still growing. And as more than $1 trillion begins to flow into cybersecurity over the next four years … I am confident this company will receive the lion’s share … thrusting this company into the spotlight and minting new millionaires all across the country. If I’m partially right … and only a small amount of that money goes to this company … the growth will still be through the roof. 1,200% growth is being conservative. 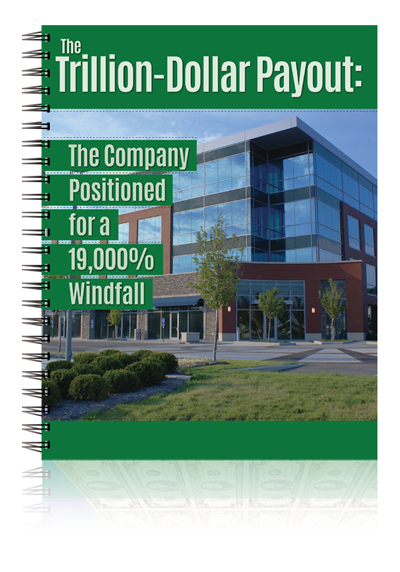 I’ve put all the details in a special report called The Trillion-Dollar Payout: The Company Positioned for a 19,000% Windfall. It tells you everything you need to know about this innovative company, the code it’s developed and how it could dominate the market as soon as the next few weeks. Normally, this report is valued at $199. But I don’t want to put any hurdles in your way that will prevent you from taking advantage of this opportunity. That’s why I’d like to offer you a free copy today simply for reviewing this presentation. Again, while the cybersecurity industry has been around for 30 years now … it is still very much in its infancy. It is still in the phase of merely detecting cyberattacks. And 10 times the global television market. And thanks to this code, this company is perfectly positioned to dominate the field. It could make the massive 5,000% gains, 7,000% gains and 19,000% gain in Check Point Software Technologies, Vasco Data, and Symantec look small by comparison. I have no doubt that by investing in this company, you will reap unimaginable profits unlike anything we’ve seen in the history of the market. You could grow your money five, 10, even 20 times or more. There is no time to waste. This stock could take off any day now. Again, you can claim a FREE copy of my report called The Trillion-Dollar Payout at the end of this presentation. The first dives into three additional state-of-the-art security companies you can buy that are also about to soar higher. From voice recognition, to biometrics and military defense, even home security systems … these three companies are introducing radical innovations that are destined to send their stocks sky-high. 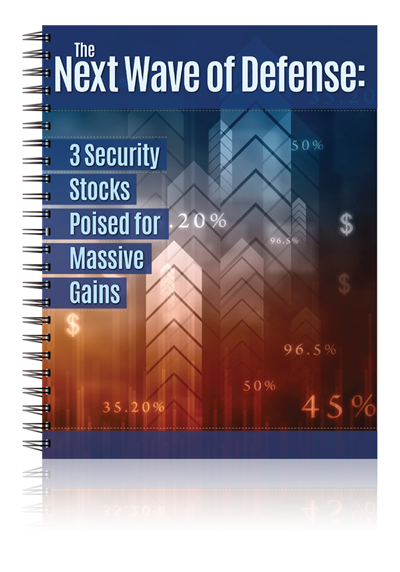 This report is called The Next Wave of Defense: 3 Security Stocks Poised for Massive Gains. In addition, I’d also like to send you a special dispatch from one of my colleagues — a privacy expert whose work has helped 14 mil lion people around the world acquire peace of mind through personal and financial security. 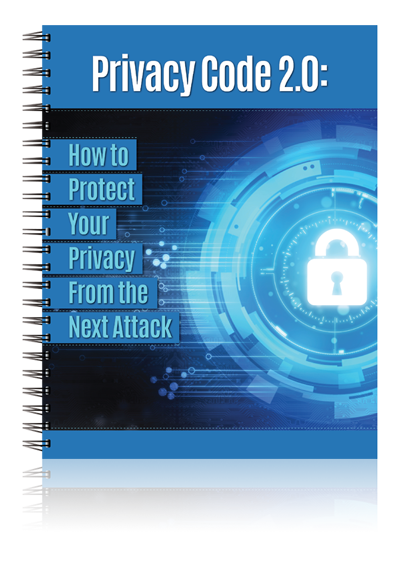 It’s called Privacy Code 2.0: How to Protect Your Privacy From the Next Attack. This report will show you three easy steps you can take to provide yourself with maximum security anytime you swipe a credit card or use the Internet, building an impenetrable fortress around your personal information so you’ll NEVER become a victim. These reports are also yours free simply for watching this presentation. Armed with this private intelligence, I’m confident you’ll be able to plunge headlong into an uncertain future, taking the precise steps you need to transform your financial life, secure your privacy and know exactly what’s coming your way. You see, my firm’s mission is simple. We believe people can take back control of their financial lives by taking a new and innovative approach to investing. By following along with our team of experts, regular, everyday people like you can be given the chance to make enormous profits unlike anything you’ve ever dreamed of. Our experts have worked on Wall Street, advised governments and created billions of dollars in wealth for their clients. We can help you transform your financial life too. 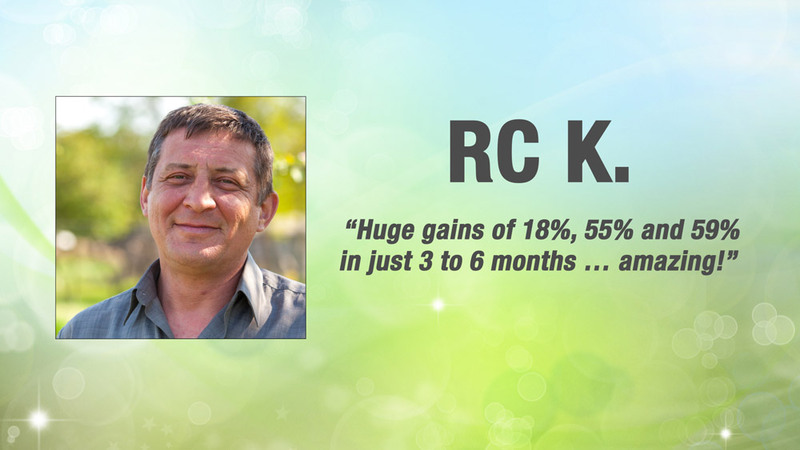 Another gentleman recently contacted us to say he made $77,150 on one position … a gain of 799% … and another $31,965 gain. That’s over $100,000 in profits from just two trades, simply by following our lead and placing a trade that took a matter of minutes. It makes me grateful to hear from so many people who have benefited from our recommendations and research. But our mission is not just to reach a few people. We want to turn the financial industry on its head. We want to bring profitable, life-changing investments to everyone. Because unless you have connections to Wall Street … you likely don’t have an army of financial analysts working at your disposal, telling you which stocks to buy and which to sell. That’s what my team and I offer. 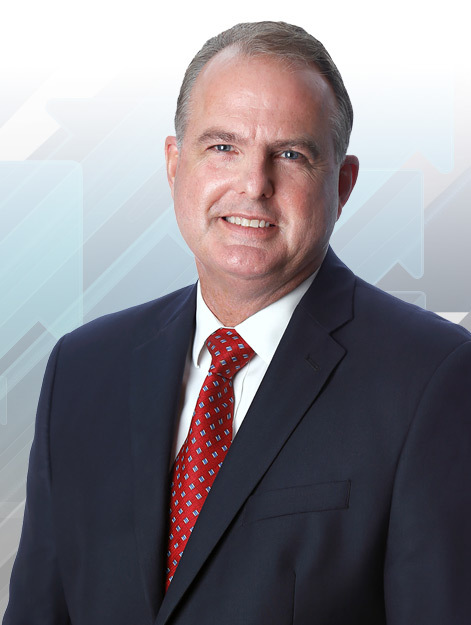 My team has managed hedge funds … worked on Wall Street … advised presidents … counseled leading organizations such as the World Bank and the United Nations … ran nonprofits … and even held public office. With our combined experience and industry contacts, we offer investment research that rivals any hedge fund … WITHOUT breaking the bank. 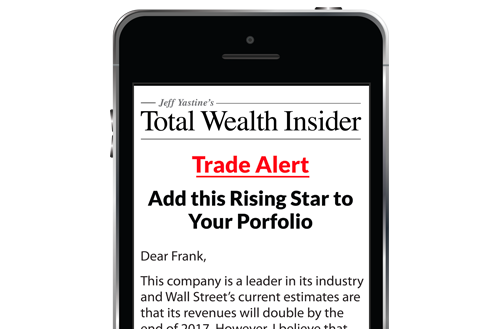 I’d like to give you the opportunity to get access to this elite team of investors, researchers and analysts by joining our flagship newsletter … Total Wealth Insider. 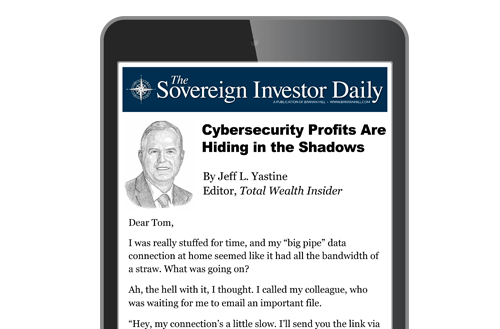 In this newsletter, I essentially give you an opportunity to look over my shoulder as I investigate the most profitable opportunities I see in the market. I tell you exactly which stocks to buy … and when to sell them for a tidy gain. The best part is, you’re in the driver’s seat. You’re the one in control making these profits for yourself. And watch as the money rolls right into your very own account for you to do with as you please. That way, you don’t have to hand over a large portion of your gains in fees you’d otherwise pay to your financial adviser. And frankly, it’s easier and more profitable than investing with an adviser or trying to go out on your own without expert guidance. Of course, there are no guarantees in the financial markets. But the potential here is indisputable as this $80 billion market grows into a $1 trillion industry by 2021. And as great as the returns I mentioned earlier are, I expect the opportunity in this code will far surpass them. We’re talking about life-changing returns. 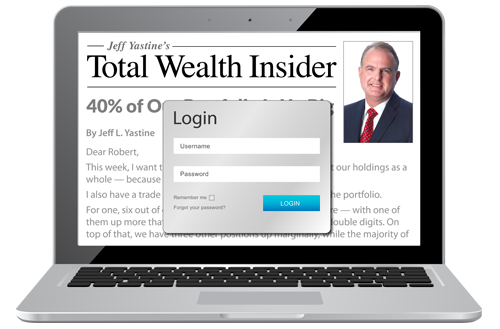 You can get started right now by accepting a risk-free trial subscription to Total Wealth Insider. When you do, you’ll become a part of my “inner circle,” with access to all of my research, including new opportunities I reveal each and every month. I’ll also include the three special reports I’ve detailed in this presentation … each a $199 value … free of charge. This portfolio includes every stock that’s on my “buy now” list. I will typically recommend 12 new stocks every year. The portfolio will tell you what to buy, at what price to buy it and when to sell. To be clear … the portfolio will not just focus on cybersecurity stocks. I look at all sectors of the market for profitable plays. If I see a good opportunity to make money … no matter the sector … you will be the first to know. This is really the best part. Every month, I dive into a specific topic tied to a recommendation I think you should take. Usually this revolves around a new investment I’m targeting. 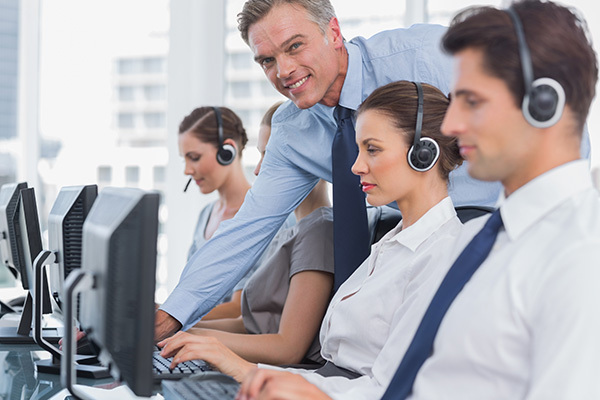 Each month, you will receive an eight-page report with complete details. You will also get my weekly podcast. With these updates, you will never be left in the dark. I’ll reach out to you every Sunday morning to fill you in on any updates to our current positions … as well as my views on any events in the market I think you should be aware of. Any time we need to sell an open position, I will send you an alert via email. I’ll provide explicit instructions on what to buy or sell, and for how much. And with today’s technology, it’s easy to utilize my recommendation over your phone, computer or tablet. It’s that simple. By joining today, you’ll also get a free subscription to our daily e-letter, where you will receive unique, profitable insights not just from me, but my whole team. We’ll advise you day in … and day out. Whenever you wish to access your subscription materials, I keep all my latest information on an encrypted website that members can access anytime, anywhere. Finally, if you ever have questions about your membership, simply give one of my team members a call. They will walk you through whatever you need. 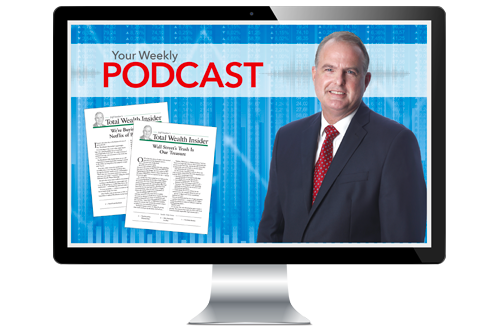 Again, once you join Total Wealth Insider, you will get access to me and my entire team for a full year or however long you wish to subscribe, receiving our guidance each day, each week and each month. That way, you will never have to worry about another stock market crash wiping out your portfolio. You will no longer have to settle for paltry returns from funds weighed down by management fees. And you will no longer have to second-guess your investment decisions. My team and I have been around the block, and our tried-and-true methods can help you get your financial life exactly where you want it. Thousands of people are already taking advantage of this research. And right now is the best time to join them. The opportunity I’ve shared with you today will not last long. Shares of this one stock could soar in a matter of days … pricing you out of an opportunity that could change your life. 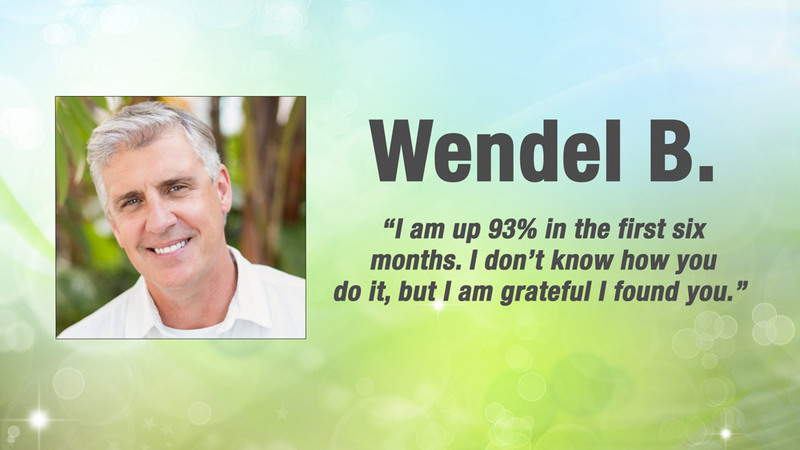 That’s why I have kept the price of Total Wealth Insider incredibly low so you can join and take action today. I don’t want to put up any barriers that will prevent you from doing so. That’s why I’d like to give you this research for what it costs my company and me to produce it, and not a penny more. 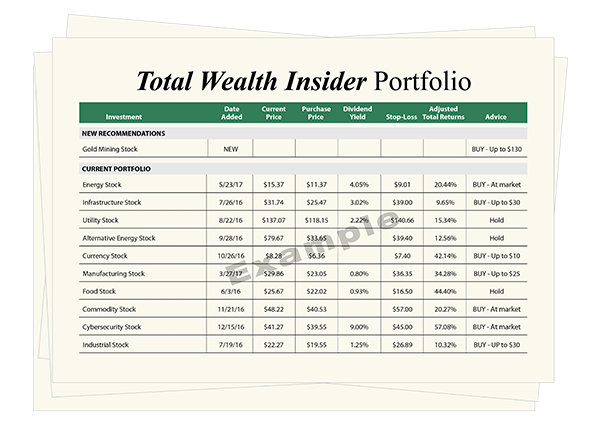 Normally, we charge $299 for access to Total Wealth Insider. Frankly, it’s a steal at that price. Add all the special reports I’ve included free of charge, and it comes to a $596 value. But I’m not going to charge you anywhere near that much. Look, I love showing others how to make money. To me, it’s rewarding to know that we’re helping others take advantage of life-changing opportunities. This is how you make the American Dream possible. I’d like to offer a risk-free trial to Total Wealth Insider — at a small fraction of the retail price — to the first 1,000 people who watch this video today. My team members think I’m crazy for doing this. But I don’t want anything keeping you away from these massive gains. I want to transform the way people invest in America, and I believe connecting you with industry leaders like myself and our team of experts is the best way to do just that. That said, I know we just met and that I’ve shared a LOT of information with you today. That’s why I want to remove any doubt from your mind that joining Total Wealth Insider is the right move. 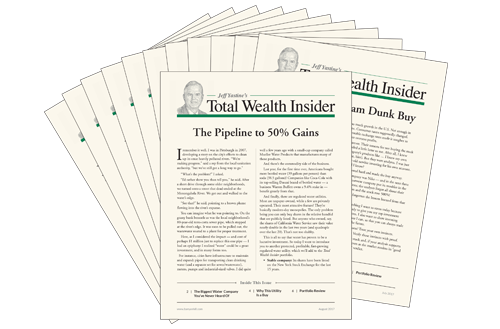 At no additional charge, I’d like to make your one-year subscription to Total Wealth Insider 100% risk-free. In other words, take the next 12 months to review everything I’m about to share. Take advantage of my stock recommendations. Act on as many as you like. 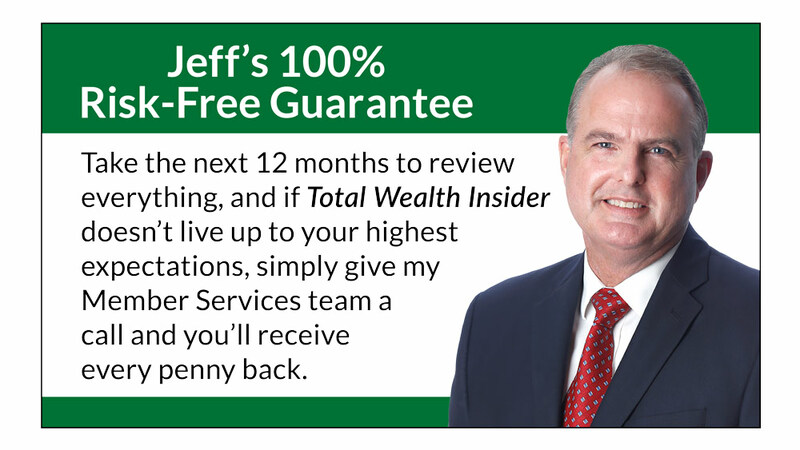 If, at any time in the next year, Total Wealth Insider doesn’t live up to your highest expectations, simply give my Member Services team a call and you’ll receive every penny of your $47 subscription fee back. You can keep all the intelligence you receive … including the three special reports you get when you sign up. Frankly, you have nothing to lose by taking me up on this offer today. Of course, I hope you stick with me for years to come. 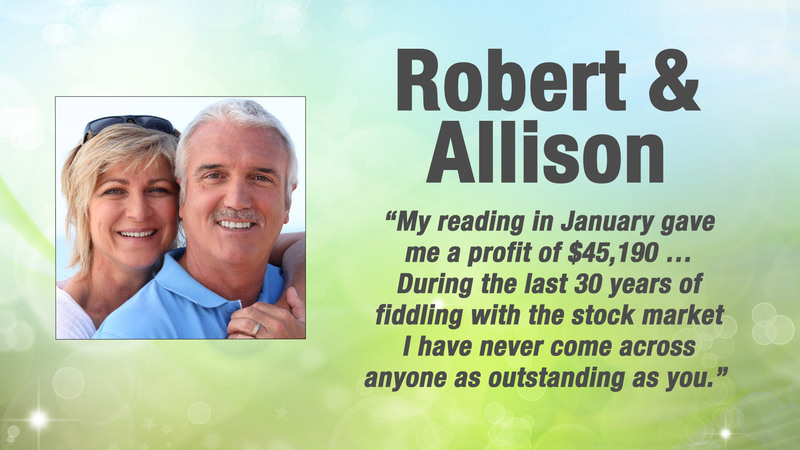 As a member of Total Wealth Insider, you become part of my “inner circle”… and I give you my full promise to find stocks with potentially massive upside to help you make dozens of 100%, 500% and even 1,000% returns on your money just as my team and I have done in years past. Thank you for listening to this important presentation. And I hope you’ll take me up on this incredible offer to receive my company’s research at the lowest price possible, risk-free. I’m confident that becoming a member of Total Wealth Insider will be the best financial decision you ever make. You’ll wish you had heard about us sooner when you see the money start to roll in. That’s because the company behind this computer code I’ve told you about today is about to pave the way for hundreds of trillions of dollars in economic growth … and make investors who get in right now incredibly rich. It will revolutionize the cybersecurity industry. It will soon become the most sought-after company on the planet as more and more economic activity happens online … and more and more devices need protecting from nefarious cybercriminals. Those who get in now in these early stages could see five, 10, even 20 times their money. Remember, the cybersecurity industry’s first wave produced gains big enough to hand investors $24,755 … $34,810 … and even $98,470 for every $500 dollars invested. 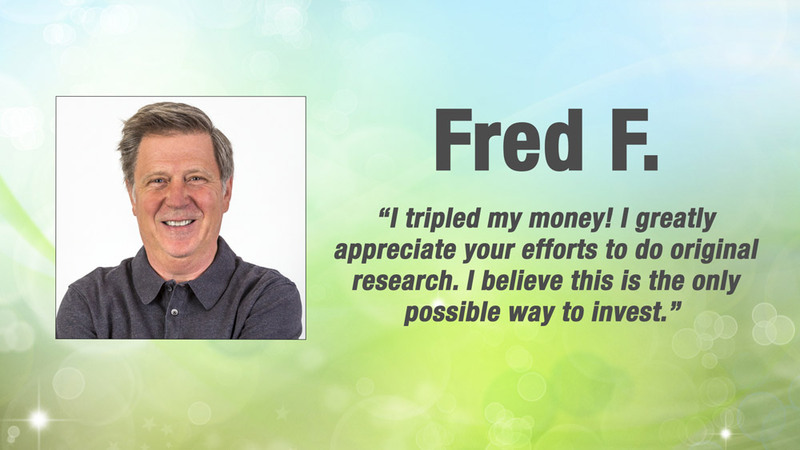 This second wave could produce far superior gains and transform your financial life beyond your wildest dreams. This technology is rapidly taking off as the world’s most powerful governments and largest businesses work to fast-track it for mainstream use. To get started, simply click on the link below. This once-in-a-lifetime opportunity is yours for the taking — but only if you act now. I urge you, don’t miss out. Thanks again, and I look forward to having you join Total Wealth Insider and enjoying a long, prosperous relationship together.